One of the most popular, versatile and delicious Italian appetizers are bruschette (plural for bruschetta in Italian) or bruschettas. I love making them anytime of the year since I can choose from a vast array of fresh, seasonal toppings. However, during this time of the year I get this weird sensation: I don’t know if it’s summer or autumn (judging by the produce available now), just as the wonderful blog Olives and Artichokes cleverly stated on its latest post Summer or autumn? So when I was in Umbria, I came up with different kinds of bruschette – some featuring summer products and some including autumn ingredients. I prepared three easy-to-make bruschette using ingredients from my mother in law’s vegetable garden, as well as local Umbrian specialities like Umbrian prosciutto and cheese. Cut figs in halves lengthwise. In a skillet heat olive oil over medium high heat. Add rosemary sprigs (2 or 3). Let oil absorb the flavour of rosemary (about 2 minutes). Add figs and cook for about 2 – 3 minutes until slightly golden. Meanwhile on a griddle (or barbecue grill) place bread slices until golden. Brush them with extra virgin olive oil. On each bread slice arrange two slices of prosciutto. Put two fig slices on top. Garnish with one rosemary sprig. Cut the tips of tomatoes. Using a teaspoon, gently remove as much pulp as you can, including juices and seeds. The purpose is to get the acidic taste of tomatoes which will pair well with the creaminess and sweet taste of ricotta cheese. Carefully place tomato sauce on each bread slice. Try to get as much sauce as possible to moisten the bread. Place a basil leave on top of the sauce and gently put a tablespoon of ricotta cheese on top. Sprinkle with extra virgin olive oil. To prepare these bruschettas, I used a local semi soft aged cheese made of cow’s milk named Casus Divinus, but Brie, Camembert, Taleggio, Tomme de Savoie or Reblochon cheeses can work as well. In a bowl using a fork, squeeze grapes. Add extra virgin olive oil and thyme. Meanwhile on a griddle (or barbecue grill) place bread slices until golden. Place cheese slices on top of bread slices, and place grape – thyme mixture on top. Garnish with a thyme sprig. Thank you and thanks for stopping by!! Hi! I am happy to have inspired you on bruschettas!! Actually that meal was from last weekend. I just tend to make posts much later in time!! i am glad you are giving it a go!! Can’t wait to see your new post!! Oh!! that would be my pleasure to eat bruschettas together! These are perfect for sharing with friends!! Three absolutely beautiful bruschette! I love the flavor combinations, especially the prosciutto and fig with the bit of rosemary. Delicious! I’m hungry now and I should be preparing for bed. Oh, well. Buona notte! I agree with you! Figs and prosciutto is a winner combination!! Buona notte anche a te caro!! These look even tastier under the bright sun! Especially the one with fig! You a right!! 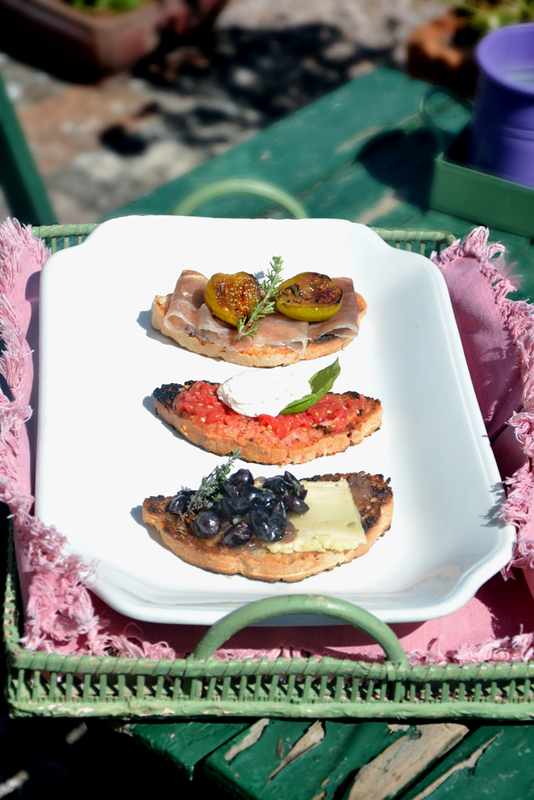 Bruschettas under sunlight just look prettier… And tasty of course! Delicious bruschette, lovely sunny photos…and thanks for the link to my summer/autumn post! There are so many figs here at the moment – I love them fresh, but also love them grilled like this. I must try them with prosciutto. You are welcome!!! That post of yours was really inspiring!! Try figs and prosciutto! I think it is such a tasty combination! 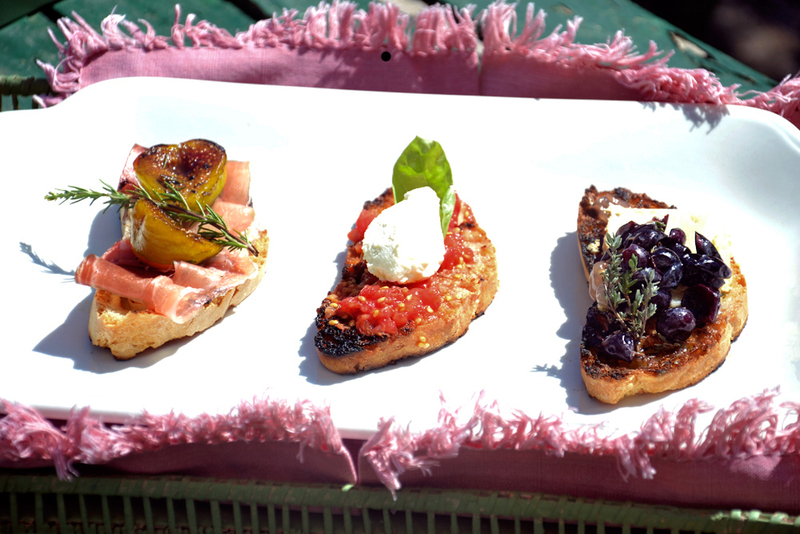 A wonderful trio of bruschette! I can’t decide which would be my favorite as each one is as good as the other!! I think I’ll just do as you did and serve all three. The presentation is awesome and your photos are stunning!!! Thank you!! I know it is hard to chose and making the three of them is a clever choice!! I love bruschette to nibble on with a nice glass of wine. It would be hard to choose which one I would pick up and eat first. No it wouldn’t…I’ll take the fig and prosciutto one first please and then try the others. Oh!! A chilled glass of wine would be perfect with the fig and prosciutto bruschetta!!! Thank you very much!! I love adding herbs to my dishes. In this case herbs add that magic touch – that special aroma that truly makes a difference!! What a delicious trio, and how wonderful to have those great ingredients to hand. Love the photos. Thank you!!! We were very lucky to have figs and concord grapes on hand!! ¡Qué rico! Estas Brusquetas tienen una pinta buenísima, gracias por la receta!! Thank you for your “terrible” compliment!!! Thank you!!! I am happy I am convincing you! Gracias Chica!!! I hope you had so much fun on your vacation!!!! We missed you!!! 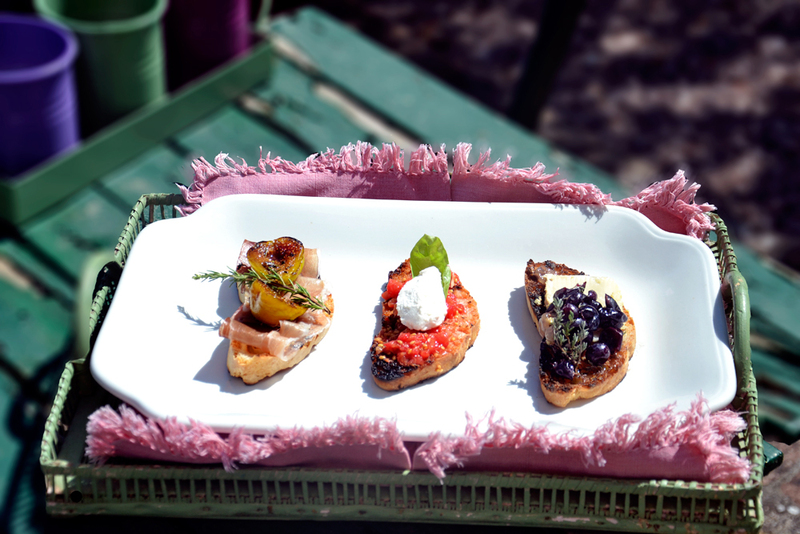 I am a huge fan of bruschetta, especially when the ingredients come right out of the garden. These look simply wonderful wish I could have been there! Thank you!!! Well. If you happen to come to Italy, you know I am in Rome!!! This is such a beautiful post! photos and writing . Can’t wait to make these! NOM NOM!! They shouldn’t be in the sun, they should be in my tummy! !